"čuveno vino" very modestly, the "famous wine"
When it comes to the “Grand Crus” of Croatia, if people know one, it would be Dingač, although I’m sure even that’s a stretch. There’s nothing shameful in this as Croatia hasn’t done much to really promote appellations, let alone try to search out its top vineyard sites. This is a pity as both the coastal and continental segments have some lovely vineyard locations. As you can read up in the Dalmatia wine book, Dingač was the first “protected region” to be established in 1961, followed by Postup in 1967. And then… it just sorta stopped there. No idea why really as they (the former Yugoslavian government) were doing things very well and proper, modeled on the ever-referenced French system, yet they didn’t continue in this pattern. When talking about the highest-quality Dalmatian wines, it’s Dingač that will often be mentioned. Based on the Plavac Mali grape the wines have indeed garnered quite a reputation over the years. It needs to be noted that it’s not always deserved and there are certainly some ho-hum bottles that pop up with the Dingač name. Postup usually gets even less attention, despite the fact it shares much in common with Dingač. All the wines are based on Plavac Mali, the soil is karst and it has a full southwest exposition, with the vines trickling down to meet the shimmering blue-green kiss of the Adriatic Sea. Obviously planted for ripeness years ago, I’ve no idea how these two famed vineyard sites are going to weather Climate Change, if at all. Plavac Mali already has problems with not attaining much acidity, so toss in another 1-2C to the ripening season and well, super bummer. 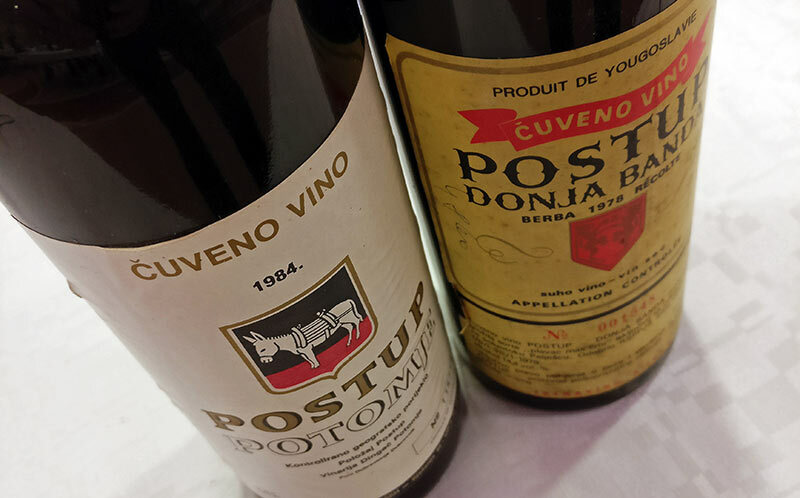 I bring these bits of Croatian wine trivia up as while at the Vinart Grand Tasting a couple of weeks ago, they held a “50 Years of Postup” tasting as 2017 marks the 50th anniversary of the creation of this appellation. Sadly, Plavac Mali is not really a grape to age for 50 years–at least not yet. They were after all saying the same thing about Grenache just a few years ago. But given this, the oldest wines we tasted were from 1994 and some of them were made under the very rare to find “Arhivno” classification. I was quite surprised at their relatively decent state given that this was a seriously rough moment in Croatian winemaking. Emerging from the breakup of Yugoslavia, modernizing cellars had just started and relearning winemaking was de rigueur for everyone no matter how long a home winemaking tradition they may have had. As we moved our way through the samples however, it was interesting to note how fast the color fades in Plavac Mali with marked rim variation in some of the bottles that were just a few years old. During the tasting, the moderators, including one of the winemakers, Boris Mrgudić, were pointing out various aspects about the creation of the appellation including its lengthy legal documents. As this was the same day I arrived, I was still banging my Croatian back into shape, but one of the more interesting bits was the name. At this point in the Pelješac Peninsula (where both Postup and Dingač call home) there is a hill named ‘Stup’. The vines sit by the hill, a little below this and ‘by’ in Croatia is ‘po’, thus Postup and why the emphasis is actually poSTUP unlike most Croatian words where it’s on the first syllable. It’s a really nerdy thing that Croatian friends in attendance hadn’t realized until they heard it and then thought, ‘duh, right’. Very illuminating tasting though as the oldest Plavac Mali wines I’d ever tasted where maybe from 1999 and this was when I was tasting them in 2007, so it hardly counted. Needless to say, more investigation is duly needed and I still believe that Plavac Mali has the potential to be a high-quality grape now that proper, modern winemaking has taken hold on the Eastern Adriatic shores. Not much hanging in there aromatically. Mostly tea leaves, lacquer, and a bit of stoniness. Hammered by whopping tertiary notes. Lightly sweet in the mouth, very condensed and potent in the mouth. Nail polish notes quite prominent. Leather and volatile acidity has ramped up a good deal. Very raisined and curly. Runs with a good brace of tannins still and fills in the mouth despite it just holding tertiary notes. Dark fruit that’s faint but still apparent. Unsurprisingly, brett is a factor but despite being present, doesn’t overwhelm. Light degree of fruit on the palate, lingers somewhat and focused more on plum notes. Good persistence but the wine is and has been on the decline at this point. Rich, racy plums and dark fruit, mossy, forest floor, bit of rosemary, pine, and light eucalyptus. Full and tannic in the mouth, good acidity still. Good finish, solid wine overall that’s aged well. More wood dominated, takes over the fruit, light dark fruit touches in the background. Full mouth, solid tannins, very representative of the style and a worthy example. Fruit has fallen off rather quickly but the general structure maintains the wine well. Bright, crisp red fruit, forthright raspberry and aged cherry notes. Alcohol does race up the nose though. Punch on the palate and medium high alcohol that’s a bit unbridled. Fruit very strong and darker in context, long persistence. High octane red fruit notes. Seems to have the VA a little up in nose. Lightly stony. Very broad in the palate with a fat wallop of tannins and dark fruit that runs into the finish. Initial bottle corked. Replacement still seems a touch maderized and stewed out in the nose although reasonably deep and plummy. Full structure in the mouth and good persistence but lacks a general direction in the integration and weight of the palate. Dark cherry and plum, prune, touch of tar, and dark chocolate with an underlying crisp raspberry note. Rich and full in the mouth. Wonderful balance. Fruit fits in very well with acidity and with a lengthy, elegant finish. Very nice bottle. Dark cherry, Christmas spice, cloves, cinnamon, nutmeg, touch of stewiness but controlled. Good deal more upright and frontal in the mouth. Tannic structure for sure but the fruit isn’t allowed out as much as it should for a wine of this age and the finish comes up a bit shorter. Feels like fermentation ran a bit cool? Mix of red and dark fruits, lively and crisp with great wild spiciness like rosemary and laurel. Punchy red fruits in the mouth with red cherry notes riding the heavy tannin wave wealth of persistence. Seriously a baby. Needs another 1-2 years in bottle before it reaches optimal drinking. Dark cherry and eucalyptus, racy and crisp, undertones of young red fruits, raisin and prune, dark chocolate, and coffee. Immediate hit in the mouth with good but not lengthy persistence. Dark fruits very prominent in finish. Probably one of the most representative of “typical” Postup.